If you have short to mid-length healthy hair and a serious lack of time in the mornings then this just might be your saviour. It retains moisture and lets the excess steam out through specifically designed vents and the results last for an impressively long time. If this method makes your hair happy then you may never look back. If your hair doesn’t take to this then you’ll be stuck with a pair of slightly strange hair straighteners but you can use them on dry hair so not all is lost. Using a heat protective serum on hair first may be a good idea to give some extra protection as well as extra gloss. This features all the standard, modern features and come with an attractive five-year guarantee. If you’ve wanted straighteners suitable for wet hair, then I think these are worth a try for the price. The time they can save you is immense and you’ll save your hair being subjected to blow-drying. Give them a go – you might fall in love (and that’s always worth it right?). Previously a firearms manufacturer, Remington made the move to branch out in 1937 into the personal care appliance industry and have not only survived the decades, but thrived through them. Now a household name globally, Remington target those who look for affordability but still expect products to do a good job and last. 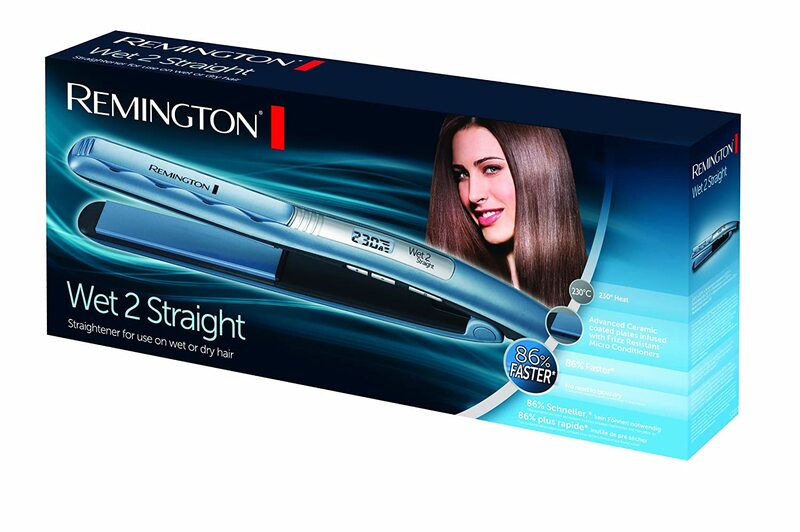 While their range of hair straighteners is usually in the budget end of things, they have produced some brilliant products in the past at very low prices and are a direct competitor of other straightening brands such as BaByliss. I’ve never really liked the idea of hair straighteners that can be used while hair is wet (or rather, towel dried) as it seems like it’s asking for trouble. However, Remington does seem to make a reasonable case for it. Aside from Remington’s continual usage of the term ‘distinct’ (which in no context they use it in makes sense) in relation to this straightener, they say that the ceramic plates lock in moisture and only allow excess to escape. As a result of the wet/damp straightening, the results supposedly last much longer and offer very healthy looking hair. Firstly, yes, hair does look surprisingly glossy afterwards but if you have thick hair, it can be quite challenging to use these while it’s damp. If you have mid length finer hair, I can see these being brilliant though. Without the need for blow-drying (which can be damaging to hair), this certainly does aim on cutting down hair’s exposure to high heat. Used on long thick hair though, hair remains ever so slightly damp and feels a bit odd – not static but almost tacky. 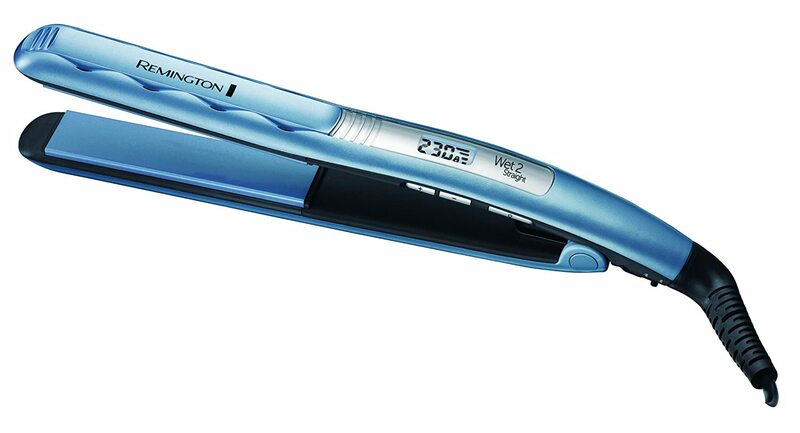 Other than its wet 2 straight technology, it features much the same as most modern straighteners: 110m long plates, swivel cord, 60 minute auto-shut off and around a fifteen second heat up speed. It also has ten temperature variations which I think is far too many and it would be just as good with five and less faff. Still, you have options ranging from 140 degrees to 230 degrees, which should suit most hair types. The icy blue design of this actually detracts from the product in my opinion as it looks a bit, well, 90s. The digital display is useful for seeing the current temperature although I always think they look a bit cheap for some reason and the whole look just gives off a clunky impression. Still, looks are beside the point at the end of the day. The price is fairly reasonable but only if this product suits your hair and I’m not entirely convinced that everyone’s hair will love the wet straightening aspect. While they claim to condition hair and make it healthier, I’m not entirely sure how true that is although I suppose it beats blow-drying your hair every day before straightening it. Air-drying is always better but I know a lot of people don’t have time for that.